Today i went to Plaza Ambarukmo with my girlfriend and i tried to use the e-directory to find one of the store i need to go to. It was smaller that i saw in Taman Anggrek in Jakarta, but both of them has touch screen feature in it. At first, i thought it would be easy to use it as touch screen is very easy to use, but unfortunately, it wasn't. I'm not saying that the problem lies in the touch screen, but it's on the system. When i used the e-directory in Taman Anggrek, it has no mount pointer in it, so all you can do is click on the buttons. They provide big buttons to locate the store and also to scroll, so no mouse pointer needed. What i saw in Plaza Ambarukmo was like a Flash format, so the touch screen replaces your mouse input. You can click and also you must drag the pointer to the scrollbar if you want to go down/up through the pages. Clicking is not a big problem, but scrolling does. The touch screen was not very responsive, thus the mouse pointer movement was not very smooth. Sometimes it stucked on one location even though my fingers has moved to another place (dragging it). Will Linus Give New Year Gifts? After failing to give Christmas presents few weeks ago, most people are expecting Linus to give the presents before this year ends which should happened around the next 50 hours (at the time i write this post). Many people are expecting the final 2.6.24 release as it should have been released by now if it wasn't late and there's no show stopper bugs around. So far, there's 247 oops in the RC release of 2.6.24, according to Kernel OOPS BugCount, which is the biggest since 2.6.17 was tracked (i don't know whether this number has dropped or not, but my guest is that this number reflected the oops counted during the first RC release and it will be updated when the final 2.6.24 released). Yesterday, my hometown had a heavy rain and it caused electrical problem (again) in some places. My girlfriend's house was affected by this problem and so did the other house around hers. My ADSL modem which wasn't connected to the UPS sometimes had to be restarted when the electricity went off even for a second. My computer stays on, since i have UPS connected and working well. Solo, a city near Jogja was rumored to be drowned, but not the whole city, but only some parts of it. I wonder what happened with Jakarta if this kind of rain dropped there? The critical month will be next month and a month later (February). I hope last year's tragedy won't happened again. MU won it's away matches against Sunderland with a big goal difference, 0-4. Meanwhile, Arsenal was held to draw by Portsmouth, which means that MU is now on top of the Barclays Premier League table, with one point different to Arsenal. It's a good sign and i hope that they will keep it that way until the end of this season. Two days ago i ordered a cake at Holland Bakery. The cake was promised to be delivered at 3 PM today to my girlfriend's house and i agreed with that. I wrote the recipient and sender information correctly and i have strongly said that to the person who received my order so that it won't delivered to the wrong person. I know that the route from Holland Bakery to my house is not that far and it could be reached under 10 minutes and today is not as crowded as yesterday, so it should be possible. I don't know what took them so long. They arrived at my house 5 minutes before i came back delivering the cake to my girlfriend's house. Which One Shoud I Use? Don't forget to look at DistroWatch for more information about the Linux distribution that you are going to use. I decided to change the setting for this blog regarding commenting. It seems that spammers are getting wild again, so for now, i changed how people can leave a comments on this blog. Now, only registered users that can leave a message on this blog, which i guess doesn't have big impact, since most of the them already have an account on other blog services or perhaps OpenID, which can be used to identify themselves. Next month (and also next year), Indonesian version of Harry Potter 7 will arrive around 12 January. In my opinion, it was a quick release, since usually Indonesian version will come out one year after the English version comes out. At least this is what happened in the previous six edition. Today i went to Gramedia book store and there was a promotion about it. I can get 10% off if i did a pre-order and i did that. I paid Rp. 50.000 and i should pay the rest when i receive the book next month. I choose the soft cover, since i had the soft cover version with the previous version. The soft cover price were Rp. 150.000 and the hard cover were Rp. 195.000. I was customer number 649 meaning that there were more than 600 people have pre-ordered the book before me (some of them were ordering more than one book). If you haven't done so, then you will have to wait for Wednesday, since i guess Gramedia will not be open tomorrow. Every year, people celebrates something, birthday, anniversary, Christmas, New Year, etc. When the time comes, people are taking opportunities to get lots of money, either by running good business or sometimes a bad one. One good example of the good business is making the Santa's hat or Christmas goods. Since it's almost Christmas (tomorrow), many Christian will surely buy those things. It happened in most events, like Chinese New Year, Thanks Giving, Halloween, etc. Well, besides good business, some people do bad business also. One of them is a lazy parking man. Today i went to the Kota Baru Church to celebrate Christmas night with my girlfriend and we went there using a car. Because we were quite late (we planned to go one hour before it, but we arrived there 40 minutes before, which is considered late, since it was already crowded). When i stepped out of the car, there was some men acting like a parking man and asked for money. He asked for Rp. 5000 and i rejected, since it's way too high. Normal rate is Rp. 1000-2000 in Jogja. So i finally gave him Rp. 3000 because it's not my car and i don't want something happened while i was in the church. Today, i was checking my laptop and i found out that my Windows primary partition (C) is almost out of space with 1,6 GB remaining. I don't realize this, since in the last few weeks, i rarely boot my laptop and always use my desktop. Even if i boot to my laptop, most of the time, i boot to my Slackware, not my Windows operating system. Back to main topic here. I was quite surprised when i had that low space problem, since i never added new things on my laptop if it's not very important (i don't like bloated system). The only things i add most of the time were Windows updates. And probably that's the problem. I searched my system and looking for the directory that holds a lot of spaces and finally i found one of them, which is C:\Windows\Installer. On my system it's only 1,25 GB, but on other forums, some of them were having 8-12 GB of space wasted on that directory. What are the files stored there actually? I tried to find some answers on Google, and most of them didn't have a good answer about this. It's said that those files were the installer information that can be used when you want to reinstall the application and it can be deleted, but they don't talk about the potential risk if those files are deleted. What do you thing 6GB represents? It's GMail's quota. It's almost 6 GB and keep counting. My email account is still 35 MB, not even 1% of the quota given by GMail. A new final version of Clamav has been released by the Clamav team. The changelog is also provided if you want to know further changes compared to the previous version. It's quite big, with 13,6 MB for the file size (source). Today is the day where i should get my new room for next year. I already received the key from the dean, Mr. Henry Feriadi. It's still empty, since i still don't have any desk nor computer to use, but i hope they will finish the migration session next Saturday and hopefully i can use any free desk and computer (i don't expect a nice shinny computer, but it's a good idea if somebody can give that to me ). I will share the room with Mr. Harald Walcher, a foreign lecturer in UKDW. I'm planning to wipe the hard disk and install Slackware Linux on the computer, so no more Windows on my computer. I'm tired of having problem with viruses and since the computer does not have the bleeding-edge specs, it would be quite heavy if i force to use Windows. Slackware Linux has been my favorite Linux distribution since 2005. There's a lot of cool things that Linux could do and Windows couldn't. * Fixed a problem where malformed BMP files could cause Opera to temporarily freeze. Today i have submitted all of my results to the administration division on my campus, meaning that my task for this semester (and this year) is already completed. It's time to start thinking about next semester which i will teach more subjects than this semester. A new version control application has been released by Canonical, the company behind Ubuntu development. Unlike CVS or SVN which use centralized repository, Bazzar (the new application name from Canonical) use a distributed repository (perhaps like in GIT). Any web server that includes a FTP server can be a Bazzar server, interesting huh? Few weeks ago i created an account on IEEE and today i got the invitation to join IEE Computer Society. They gave a discount US$90 if i'm willing to join before the end of this year (31 Dec 2007). I will think about it first, as the rate is quite expensive (for me). Personally, it's very interesting, since i can get access to more than 1300 courses and also got IEEE magazines, etc. I wonder if my campus has already subscribe to this community or not. Usually, when i sign in to my GMail account, then i launched blogger's URL, it went directly to my dashboard, where i can choose which blog i should write, but lately the integration between those two services were lost (or broken). I don't know why. Perhaps it only happened on my browser. Well, it's just blogger, as i can logged in directly to other Google's service, such as Google Docs, GoogleGroups, and many other services. From today's meeting, i got a new assignment for next semester, which will be Internet Application Engineering (i don't know if it's the correct translations from "Rekayasa Aplikasi Internet"). The focus for this subject is to introduce Internet application as much as possible to the students in order to prepare them for the next subject, Web Engineering, where students are taught how to develop a good web application, starting from requirements, planning, designing, until implementation. For convenience, you can set to Anyone, with some risk that anonymous poster will be allowed to post. If you want to identify all commenter, you should use second or third options. Fourth options is the most strict options by only allowing member of the blog (if you have several contributors) to comment on the blog you are running. Next thing is deciding the silabus for the other material. I'm still confused with this one, since i don't have the textbook (yet), but i will go to the library next week to find the correct book for this subject. Hopefully i can find a good one. After Google Doc and MS Office online (trial), now it's time for OOo to have online version of it's application. It's not done by the OOo team itself, but by Ulteo. They have made several application to have online several applications, and now it's OOo time. In order to try out this service, you will have to sign up for an account (which is free and very quick). After activating your account, then fire up the URL and wait until the applet is loaded. 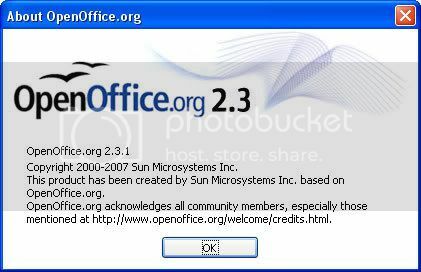 Pick the application you want (Writer, Calc, Impress, Draw, Math, Base) and click Launch OpenOffice.org NOW. You need the latest Java JRE in order to use this feature. Don't try to load this software if you are using slow connection, since it's quite heavy. It's still based on 2.3.0, but it's not a big deal, since 2.3.1 is only a maintenance version. I was supposed to be on Dieng right now to attend a training held by my campus, but i canceled it because i was not feeling very well and i should attend a busy class tomorrow. I wish i could join the training, but lately, i knew that if i joined that training, it would be bad for me, since this morning, i realized that i was infected by chickenpox. I guest it was infected by one of my student, because he had this disease also. The problem was i met him at the last meeting of my class when he shouldn't be attending the class, since he still had chickenpox (probably he didn't aware of that), so i got infected also. Plus my condition wasn't fit in the last few days, so it's like 2-in-1 combo that struck me. I hope it will recover ASAP, since i still had some activities to do next week. Google has made developer's life easier by releasing Google Chart API which can be used to create chart online. Just arrange your data, and point your browser to Goggle's site with the correct query string and voila... you will have your chart presented If you want to embed it into your webpages, then you will have to use img tag to include it as an image and that's it. Nothing is simpler as that. Of course the style here is not OOP like in JpGraph and also the parameter can be confusing, as you have to combine all of them in one single query string, but if you're used to it, you will be fine in just a few days. Two new features has been added into GMail, which is AIM chat client and also colored labels. Now you can chat with AIM's friends (i think it's only popular in US). To use this features, you will have to use the latest browser version (IE 7 and Firefox 2). I don't know whether Opera has support on this, but i think it's just a matter of time if it doesn't. After few weeks of compiling, testing, and working, finally Budi has managed to release the first Forum Linux 7.12 Release. The ISO size was reduced quite a lot compared to the last beta. It's less than 200 MB (about 188 MB). FYI, Forum Linux is based on targeT, which is based on Slackware 11.0. Pending forum account should also wait until tomorrow. Sorry for this inconvenience. 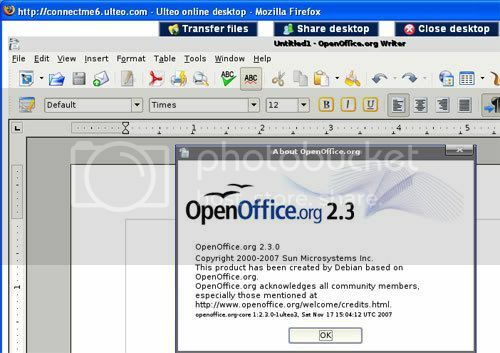 The first maintenance version for OpenOffice.org 2.3.x series has been released. It's called 2.3.1. Since it's a maintenance version, most of the updates were correction and bug fixes, not adding new feature (that should wait for 2.4). Some mirrors are still syncronizing (meaning that most of them are still having empty directory), but for now you can get it from PlanetMirror (Australia). Thanks to Maseko, i found out that Blogger will (soon) support OpenID for comments. Unfortunately, they don't have any plan (yet) for supporting OpenID for registrations. It will be a good one if they could implement this also.